Bill Jackson joined McAlvey Merchant & Associates in the fall of 2011, leaving a highly successful career in corporate America to add his expertise and experience to our lobbying team. Prior to joining McAlvey Merchant and starting his corporate career, Bill was a small business owner who got his start in advocacy fighting for trail access for customers of his family’s bicycle store. He was on the ground floor working with avid cyclists to create several bicycle-friendly local advocacy organizations. 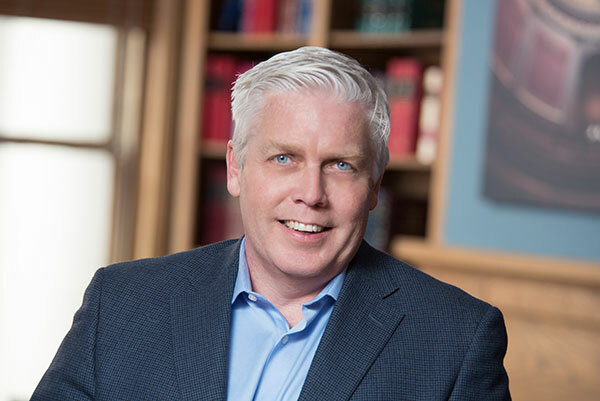 After selling the family business in 2000, he joined Adams Outdoor Advertising as the Statewide Director of Government Affairs, where he directed the advocacy efforts of the nation’s largest privately owned outdoor advertising firm in Michigan. While at Adams Outdoor Advertising, one of Bill’s many accomplishments was leading the highly regulated outdoor advertising industry’s successful effort to overhaul Michigan’s Highway Advertising Act of 1972. Bill was also the first Director of the West Michigan Regional Policy Forum, a regional initiative built around the advocacy of five public policy directives. As director, Bill developed the framework and established the structure for pursuing the achievement of the policy forum’s goals and authored the inaugural policy agenda. Bill Jackson received his Bachelor’s degree from Central Michigan University and earned his Master’s from Grand Valley State University. While in college, Bill joined the Sigma Chi fraternity and jumped right into elected office, serving as the CMU Chapter’s Treasurer and New Member Education Chair He is also a graduate of the Michigan Political Leadership Program at Michigan State University, a program for which he continues to serve as a member of its Advisory Board. Outside of his professional life, Bill is committed to his family and the Grand Rapids community where he lives. Bill is a co-founder of the Volley for Mitchell Charity Volleyball Tournament, serves as the Treasurer of the Finish the Mission Veteran Relief Fund, and is a board member of Rockford Forward, a community action group. Over the years, Bill has served on the Cannon Township Planning Commission, was the Treasurer of Gateway Middle High School in Grand Rapids, headed the fundraising efforts as a board member of the Rockford Little League and continues to volunteer his time coaching youth baseball. Bill is an avid sportsman and enjoys cycling, kayaking, hunting and fishing and brings the intimate knowledge and experience to his work on conservation and outdoor related advocacy work.